Happy Friday, everyone! I hope you're gearing up for a wonderful Autumn weekend. I wanted to show you a little project I've been working on in my guest room. Next week I'll show you the completed room. . . Lord willing, I'll finish the room just in time for the arrival of several overnight guests. My guest room has a long wall that I've never quite figured out how to accessorize--so I've left it alone. I had four old art prints that I wanted to use, but the grouping was a little too small for this wall. 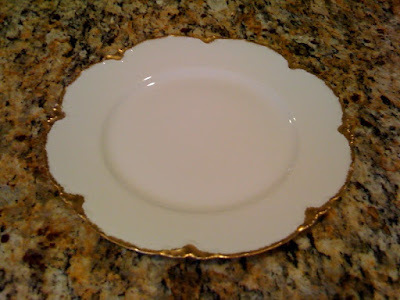 Haviland china, made in France. Six of them, to be precise. $0.68 each. They were terribly stained, but pretty, and I decided that I could take a chance with them for that price. I brought them home and ran them through the dishwasher, and they came out looking brilliant! Stains gone! I wondered how my prints would look hanging with the plates, and I figured there was no harm in trying it out. First, I readied my plates for hanging by hot-gluing saw-tooth hangers on the back. I figured the charm of my bargain would be marred by having to spend money on plate hangers. Besides, this method works well and can't be seen from the front. My method of hanging things in groupings is very scientific. I eyeball it. When things look even, I call it good. Four prints and two plates. Hmmm. I wondered if I should stop with just this grouping, or if I wanted to use all six plates. I didn't want to put holes in the wall and then decide that I didn't like the whole composition, so I copied Holly's method of taping plate-sized pieces of paper to the wall. I liked it (thanks, Holly! ), so I decided it was worth it to keep going with the hammer and nails. What do you think? Come back next week and see the whole room! P.S. The winner of the Halloween giveaway is Tanya from FrouFrou Britches. Tanya, your package should arrive soon! what a bargain! thanks for the tip on how to hang the plates-great idea! Thanks for the shout-out! What gorgeous plates...they look so pretty on the wall! What a great idea! I never would've thought of hot glue for the hangers. So smart!!! It looks great and what a bargain! Can't wait to see the whole room. Thanks so much for the sweet Halloween towels and pumpkin. I'm so excited!!! Great tip on the glue for the hangers! Love the progress so far! Brilliant! That's one of those "I can't believe I never thought of that" ideas. This is how I'm going to hang plates from now on. Well I'll be? I have never seen them hung this way Richella. Very clever and it looks fantastic! Thank you for showing us. This is a lovely idea, but now I'm dying to see the rest of the room! The wall looks beautiful. Love it that you mixed them with framed art.I love decorating with plates. I'm afraid the glue won't hold the weight of the plates. Can you add some super glue to the hot glue? You know I have OCD and sorry, I don't mean to pass it along, but I'd hate for you to lose one of those treasures. What a clever solution for hanging plates. I don't remember reading that on Holly's blog, so I'm glad that you told us this trick. Your plates look fabulous with your art. I'm excited to see the finished room. Super cute! I like the way you have grouped them. What kind of adhesive do you think you are going to use? This is my first time at your blog and I've decided to come back soon! This is fun and you seem to be a loving person. Looks good to me and can't wait to see the whole room. I like that you added all of the plates. It looks 'finished' and I love it!